When I first came to interview at my current position, I of course noticed all of the beautiful diamond jewelry the women in the office were wearing. I especially took notice of the 5 carat on my future boss’s hand. Later, after being hired, I was privileged enough to wear the “Queen Mother” as it is fondly called, since the head that holds it is shaped like a crown. Being the gem geek that I am, I had to know all of the particulars of the diamond. What I found out was a little stunning seeing how the Queen Mother gives off the most beautiful icy blue color in person. The Queen Mother is I color and SI1 clarity, with no fluorescence. I was stunned to learn the color of the Queen Mother, because I had expected it first to be colorless. 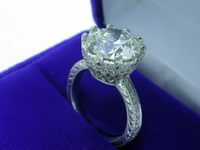 Secondly, if you have two diamonds with the same color grade but of different carat weight, the diamond that is of larger carat weight will appear darker. My analogy for this is if you have a bottle of wine and you pour two glasses, but one is skinny and one is fat. The fat glass will look darker because there is more material to look through. Since then, when I am speaking to a close friend or a customer, I always say the same thing when talking about diamond color. All girls want white and bright diamonds, and the most common response that I receive is, “Does that mean I have to buy a diamond in the D, E, and F (colorless) color range?” No. 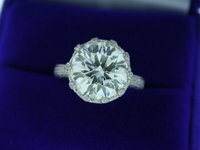 My recommendation when you first begin looking at round cut diamonds is to start out at I color. 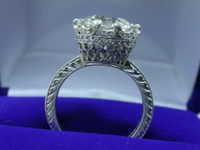 I have found that I color is white and bright in 14 karat white gold or platinum engagement rings. However, with fancy shapes I find that it is best to go up a color grade and begin at H color. For some reason fancy shape will show more.